But the Dog Star” Sirius matters as Noah Brosch said in his book. Sirius is the brightest star in the night sky and can’t be missed in a city, nevermind in a desert. Mostly called the “Dog Star”, in China the “Blue Beast (wolf)” Sirius represents the Heavenly Wolf and in Greece and Roman culture it was associated not only with the dog, but also with wolf and jackal. Sirius absolute brightness is 23 times as bright as our sun and the fifth nearest star to our solar system. Known to astronomers as Alpha Canis Major, it is the principal star of the constellation Canis Major (the Big Dog). The brightest of the nighttime stars, Sirius caught the eye of the early sky watcher and can even been seen in daylight with a telescope. Sirius is a binary star. Very long ago, Sirius could not even be seen in the sky from some places. This was because of a phenomenon known as the Precession of the Equinoxes. The Precession is a very slow wobble of our planet taking the polar axis of the Earth in a circular swing of 47 degrees every 26,000 years. For the Egyptians, Sirius was, astronomically speaking, the foundation of their entire religious and temporal system. It was the embodiment of Isis, wife of the god Osiris, who appeared in the sky as Orion. Egyptians called Sirius the “Dog Star”, after their god Osiris, whose head in pictograms resembled that of a dog.The ancient Egyptians called it Septit, the Hebrews knew it as Avrek or Sihor, to the Greeks as Sothis and also as the “the Dog Star” that followed Orion the Hunter. On that latitude the “Star in the East” in our Gospel accounts, was on the meridian line. The reason why the Egyptians and many other civilizations of that era used Sirius as their marker for the passage of time is because they picked the most stable object as their reference point. In Egypt, almost all the temples were aligned with this line, including the gaze of the Sphinx. Many of the temples had a tiny hole in the wall somewhere; then there would be another wall and another, going into some dim inner chamber. The tomb of Senenmut, chief architect, lover and astronomer during the reign of Queen Hatshepsut the only female pharaoh, featured lovely astronomical ceiling. On its walls are extracts from the Book of the Dead. Hatshepsut’s temple is ideally placed to view astronomical events towards the eastern horizon, particularly the Orion constellation and the star Sirius. The alignment of the temple is set on an azimuth of 116½° ±½°. On the Senenmut calendar it is surely the sext idol from right with dog-head and a star above his name. In this case it can be the Canis Major, the Sirius dog, opposite to the Sumerian dog Rahu. The periodicity of the helical rising of Sirius was such that the Egyptians based their calendar on it. Every year for millennia the appearance of Sirius coincided with the flooding of the Nile, an event that remarkably still happens to this day. Etymologists have suggested a connection with the ancient Egyptian god Osiris, but none can match the “Star of Isis”. Since earliest times the ancient Egyptian paid particular attention to Sirius, which they identified to the ‘soul’ of the Goddess Isis. Historic and mythological descriptions of Sirius provides further insight into the nature of the relationship between the Sun and Sirius. A shaft leading from the Queens chamber of the Great Pyramid of Egypt has been aligned precisely with Sirius. In his book Echoes of Ancient Skies, the archaeo-astronomer Dr. Ed Krupp writes that, “After disappearing from the night sky (for 70 days) Sirius eventually reappears in the dawn, before the sun come up. The first time this occurs each year is called the star’s heliacal rising, and on this day Sirius remains visible for only a short time before the sky gets too bright to see it. In ancient Egypt this annual reappearance of Sirius fell close to the summer solstice and coincided with the time of the Nile’s inundation. Isis, as Sirius, was the ‘Mistress of the Year’s beginning’, for the Egyptian new year was set by this event. New Year’s ceremony texts at Dendera say Isis coaxes out the Nile and causes it to swell. The metaphor is astronomical, hydraulic, and sexual, and it parallels the function of Isis in the myth. Sirius revives the Nile just as Isis revives Osiris. Her time in hiding from Seth is when Sirius is gone (70 days) from the night sky. “The coming of Osiris – the savior of Egypt – was associated with the “Star in the East” because the Egyptians recognized that the rising of Sirius with the sun, or “heliacally,” occurred around the summer solstice, the time of the Nile flooding. L ife along the Nile was highly dependent upon the inundation associated with the heliacal rising of Sirius, a flood deified as Osiris, who was said to be “born” at that time. In addition, Pyramid Text 593:1636b/M 206 states: “Horus the pointed has come forth from thee, in his name of ‘Horus who was in Sothis. '” “Horus in Sothis,” therefore, refers to when the sun rises with Sirius. Thus, in ancient texts we find the birth of Horus the sun associated with the star in the east. 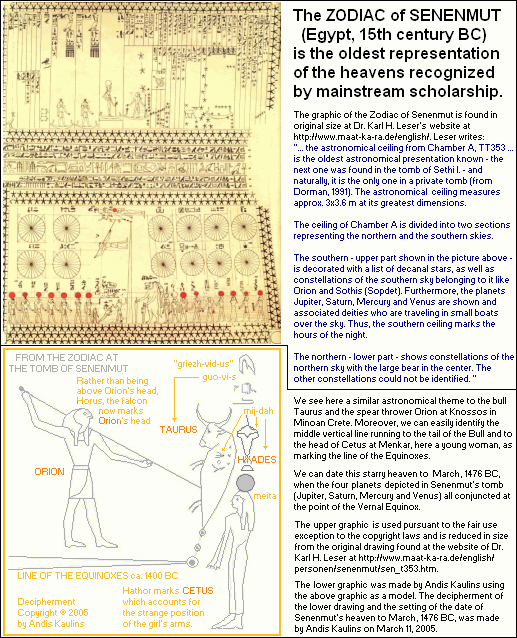 As we can see, the annual emergence of both Sirius and Orion were closely noted, meaning that these celestial events were significantly in the minds of Egyptians for thousands of years. Moreover, the “rebirth of life” in Osiris – his resurrection on Earth – constitutes an annual event, in the Nile’s flooding. There is more than one connection between the Egyptians and Christianity. “Osiris’s coming was announced by Three Wise Men: the three stars Mintaka, Anilam, and Alnitak in the belt of Orion, which point directly to Osiris’s star in the east, Sirius (Sothis), significator of his birth.” One must envision that the Virgo was rising in the East at the same time Sirus was visible in the east as well. But also Orion, called “The Three Kings” by oriental astronomers, was in proximity to these other two constellations. Virgo is called Spica; it is to be found in the “ear of corn” (sign of fertility) which the Virgin holds. Much has been made of the Matthew gospel account of the “star in the east” followed by “wise men” from afar, claimed to have heralded the birth of the newborn savior of the world. And many ancient gods, kings and heroes were said to have been born under a ‘bright star’ or some other sort of celestial sign. The biblical Book of Job (38:32) also contains reference to the Mazzaroth, or “zodiac,” and demonstrates significant astronomical knowledge, an important fact in consideration of the contention that, centuries later, the Jewish priesthood rehashed the Egyptian astrotheology in its “midrashic” or fictitious account of Jesus Christ. The three highly visible “king-stars” of the splendid constellation of Orion are named Mintaka, Aniltak and Anilam or Alnilam, the latter of which means “string of pearls,” while the former two signify “belt.” The statement in the Egyptian texts that Sothis “leads Orion” thus constitutes the motif of the bright star followed by these three “kings,” which have also been called the “three kings of the soothsayers,” a title that may indicate the antiquity of this royal appellation. The appearance of the three stars in a line with Sirius occurred in the night sky over Egypt thousands of years ago, pointing to the horizon as the new sun was born at the winter solstice. Thus, it could be asserted that the three kings trailing the bright star announced the birth of the savior at the winter solstice in Egypt, ages prior to the same event purportedly taking place in Judea. There is much speculation on the origin of its modern name which is generally thought to be derived from the Greek word “Sirio” meaning sparkling. Around 150 AD, the Hellenistic astronomer Claudius Ptolemy described Sirius as reddish, along with five other stars, Betelgeuse, Antares, Aldebaran, Arcturus and Pollux, all of which are clearly of orange or red hue. The discrepancy was first noted by amateur astronomer Thomas Barker, squire of Lyndon Hall in Rutland, who prepared a paper and spoke at a meeting of the Royal Society in London in 1760. The existence of other stars changing in brightness gave credence to the idea that some may change in colour too; Sir John Herschel noted this in 1839, possibly influenced by witnessing Eta Carinae two years earlier. Thomas Jefferson Jackson See resurrected discussion on red Sirius with the publication of several papers in 1892, and a final summary in 1926. He cited not only Ptolemy but also the poet Aratus, the orator Cicero, and general Germanicus as colouring the star red, though acknowledging that none of the latter three authors were astronomers, the last two merely translating Aratus’ poem phenomena. Seneca, too, had described Sirius as being of a deeper red colour than Mars. 2013 is upon us, and we survived all the dire predictions about how the world would end did not happen. Among their reasoning was a total misunderstanding of the sacred Mayan calendar. The Maya understood 17 different Calendars based on Venus, Mars, Sun and Moon and most prominently the Pleiades with the precession of the equinoxes, a cycle just short of 26,000 years. So even Sirius was not accurate enough for the “Keeper’s of Time”, the Mayans. With their remarkably advanced astronomy they quickly detected the inaccuracies in using Sirius as a marker for the passage of time, and switched to an even more accurate cycle involving the Pleiades. The Mayan view of the afterlife consisted primarily of a dangerous voyage of the soul through the underworld, which was populated by sinister gods and represented by the jaguar, symbol of night. The majority of Maya, including the rulers, went to this underworld. Heaven was reserved for those who had been sacrificed or died in childbirth. Like in any ancient belief system, to the Maya, science and religion were one and the same. The Maya developed an impressive mathematical achievements included positional notation and the use of zero; and in astronomy, they accurately calculated a solar year, compiled precise tables of positions for the Moon and Venus, and were able to predict solar eclipses. For the ancient Maya, the Pleiades represented the principle of life on Planet Earth, and this is why it formed their sacred calendar. Mayan religion and mathematics were intimately connected with the seven stars, or suns, of the Pleiades. I traveled Yucatan once, where Mayan temples are fascinating. The calendars that are most important to beings of earth are the Haab, the Tun-Uc and the Tzolk’in. The Tzolk’in is the most important and the one with the most influence. The Haab is the Sun calendar. It has 360 + 5 days, totaling 365 days. The Haab uses 18 months with 20 days in each month. There is a 19th month called a Vayeb and uses the 5 extra unlucky days. Each month has it’s own name/glyph. Each day uses a sacred sun/glyph. The Tun-Uc is the moon calendar. It uses 28 day cycles that mirrors the women’s moon cycle. This cycle of the moon is broken down into 4 smaller cycles, of 7 day each. The Tzolk’in is the sacred calendar of the Maya and is based on the cycles of 260 days. The cycle of the Pleiades uses 26,000 years, but but encompassing 260 days might allign the Venus cycle. The Mayas knew the importance of the period of 2920 days equal 8 years by 365 days, in which the Venus repeats its movement in relation to the sun, same as the Babylonian did. The “Dreseden codex” in Germany contains tables for predicting solar and lunar eclipses and ephemerides from Venus and Mars for two rounds. Two kinds of empiric sidereal intervals of Mars were used, a long one (702 days) that included a retrograde loop and a short one that did not. While Kepler solved the sidereal problem of Mars by proposing an elliptical heliocentric orbit, anonymous but equally ingenious Maya astronomers discovered a pair of time cycles that not only accurately described the planet’s motion, but also related it to other cosmic and terrestrial concerns. Today we only choose the Sun as our reference point, and this is obviously highly inaccurate. Every 4 years a day has to be added to keep accurate time. There is however an even more stable reference point than the Pleiades and that is the Galactic center, which from the perspective of our galaxy is the ultimate center of rotation. And indeed the Mayan’s chose the Galactic Center as a reference point to mark the passage of time, which is evident as the Mayan Long Count ends with the galactic alignment of the Solar System on December 21st 2012. Even as late as the 1970s Sirius became the subject of a (now rejected) theory linked to the Dogon tribe of Mali to recent scientific knowledge of Sirius. The majority of Dogon practice an animist religion, with a significant minority of the Dogon practice (Sufi) Islam, another minority practice Christianity. Sufi historian Indries Shah traces the name of the Illuminati back to a verse in the Koran which mentions a shining star, and Umar Al Sufi a Persian astronomer mentioned it in the 10 century. That knowledge of the Mail tribe concerns Siriusas a binary system. Sirius A is the highly visible star, but there is a companion known as Sirius B. From Africa, where the Dogons live, the star Sirius disappears below the horizon and is out of sight for a couple of months; then it appears again on the morning of July 23, when it rises about one minute before the Sun. It appears bright ruby-red, just above the horizon, almost exactly due east. Sixty seconds later the Sun emerges. So you can see Sirius for just a moment, then it’s gone. This is called the helical rising of Sirius, which was a very important moment for most of the ancient world, not just for the Dogons and Egypt. This is the moment when Sirius and the Sun and the Earth are in a straight line across space. Sirius has been found linked with every great religion of antiquity. Why? One reason might be was a much better timekeeper than the Sun. But as has been shown, the star Sirius has played a prominent role in astronomy, myth, religion, literature, and history always with an archetype of wolfish character. The Rise of Early Modern Science – Islam, China and the West, Huff, Toby E.
Plans of the different Temple sitescan be taken from Google Earth mapping Programme. Carl Johan Calleman. The Mayan Calendar and the Transformation of Consciousness. Tags: Buddhism, Evil, godnesses, Mystic, outlaws, Psychology, Religion, Science, uebermensch, Wolf. Bookmark the permalink.